We’ve put the new GTX 1060 through its paces with the open source API and Nvidia’s latest darling simply can’t cope. The latest GeForce is still a great card for the vast majority of games, check out our in-depth review of Nvidia’s GTX 1060. 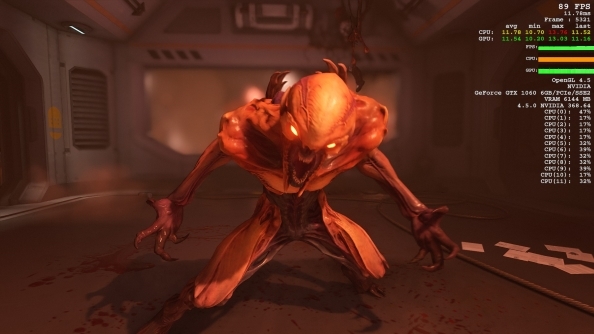 Just a couple of weeks back id released their latest patch for Doom, delivering a version of the shooty-shooty-bang-bang game running on a brand new graphics API, Vulkan. This was in a time before the GTX 1060 had been released and we could only pit the AMD RX 480 against its nearest Nvidia rival, the GTX 970, in a Vulkan-based fight to the death. Now the dust has settled I’ve had the chance to get the spreadsheets and scientific calculators out again (benchmarking Vulkan gives me such a brain-ache…) and test the two new mid-rangers head-to-head. And unlike pretty much every other independent benchmark around right now this time AMD has got the win all to itself. And it’s actually a quite bruising defeat for Nvidia with the new Vulkan API. AMD’s RX 480 delivers a performance boost compared with its own OpenGL performance, while the Nvidia GTX 1060 either stays at the exact same level or, in the case of its 1080p performance, suffers a slump in form. That’s pretty catastrophic in terms of what it means for the frame rate delta between the latest Radeon and GeForce cards, with the GTX 1060 being 25% slower. At best. In fact when you take that 1080p performance into account the RX 480 is more than 50% faster in Doom with Vulkan turned on. If you were to just take the game in its original OpenGL guise the GTX 1060 still has the edge, but the new open source graphics API has completely flipped that on its head. That’s maybe not such a huge surprise given the Vulkan API is effectively a successor to AMD’s own Mantle API. Vulkan apes Mantle’s close-to-the-metal design, allowing game developers to get more direct access to the PC’s available hardware than when it’s hidden behind the standard abstraction layers used in older APIs such as DirectX 11. At the moment though there are only four games with Vulkan support available (Doom, The Talos Principle, Ashes of the Singularity and DOTA 2), but the list of game engines with Vulkan support could make things more interesting for future releases. Unreal Engine 4 has Vulkan support, obviously the id Tech 6 engine does and Valve’s Source 2 engine also loves it some Vulkan action too. Which obviously means Half-Life 3 will play best on AMD cards, right?